Each year, over 400 men and women graduate MSU with degrees in economics, and each year the Department of Economics honors the best and brightest of these economics students during an awards reception held at the close of the spring semester. All of the students recognized at this year’s reception compiled excellent academic records in their economics courses, and most participated in the department’s Econ Scholars program, designed to enrich the experience of our best undergraduate students. 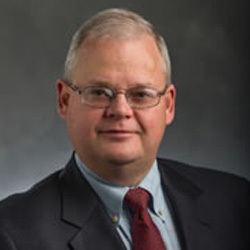 While the past year has been a challenging and transitional year at MSU, I am pleased to report that the Economics Department at MSU continues its mission to meet the educational needs of students and to carry out world class research. 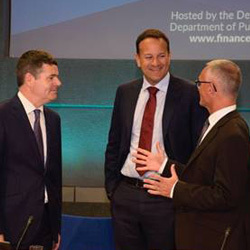 Alan Barrett (Ph.D. 1994) is pictured on the right with Ireland’s Prime Minister, Leo Varadkar, and Finance Minister, Paschal Donohoe. The event was the National Economic Dialogue which Alan has chaired each year since 2015.